I’m an expatriate Englishman living in the United States; 46 years old, married, with one kid. I’m not in any way, shape, or form a professional fashion historian, although I am an academic in a different field. So, to quote from a 1967 Vogue article, why boots? Well, with a few notable exceptions (e.g. Bradley Quinn’s 2010 book, The Boot) no-one has really tackled the history of women’s fashion boots. This is an odd omission, for several reasons. First, there are very few garments that sit so solidly at the nexus of fashion and fetish. A woman in boots plays with our ideas of gender, even when the style of boot is unreservedly feminine. This is a paradox that historians like Valerie Steele have touched on. Finally, the emergence of the boot as a fashion item for women is intimately linked with the cultural upheavals of the nineteen sixties and seventies, the so-called “youthquake” and the upending of the traditional role of a woman as wife and mother. In boots and hotpants a women can be both objectified and liberated, another paradox. Boots are a part of my history too. 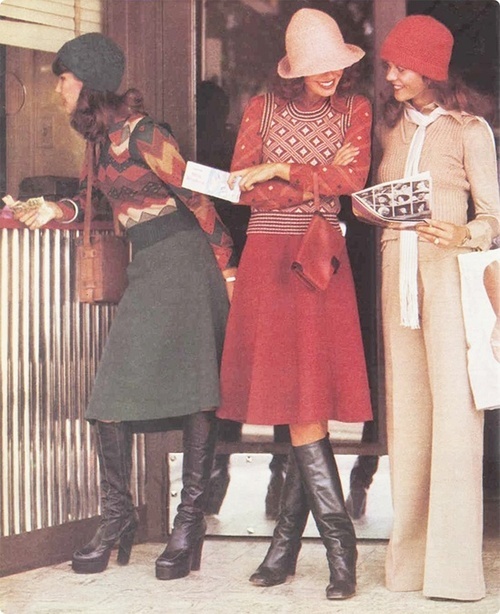 I was born in 1966, so I missed out on the first wave of fashion boots, but if you hold to the belief that the mid to late nineteen seventies were the first real golden age of boots, then they were very much part of the world in which I grew up. I’ve tried to channel that into something productive. This blog is the third string of a larger project. The first part, the Wikipedia entry for “fashion boot” is something that I’ve been working on for a couple of years now. It contains a lot of research, in terms of tracking down citations, but I felt stymied by Wikipedia’s insistence on copyright free media. It was hard to show what I was talking about. Hence the second string, the Tumblr blog “Made for Walking.” I use that to accumulate and display a collection of images of booted women from the 1960s, 1970s, and the first few years of the 1980s. I’m relying on a fair use argument to justify my republishing of copyrighted material. Hopefully it holds up…. Finally, there’s this blog, which will let me discuss some of the issues that I didn’t have space to deal with in the Wikpedia entry or the Tumblr. There’ll be a very small number of images here, but mostly it’s a home for text. I ve discovered your blog recently and just wanna enter to say hello and Congrats!